OK, we get it. Maternity services: the clue’s in the name. Mums are the ones who give birth. They matter most. But the UK is a wealthy country with a raft of gender equality legislation, where we’ve had statutory paternity leave for 15 years, and give all dads the right to attend antenatal appointments. Is it really too much to ask the NHS to treat fathers like they count too? and 94% met healthcare professionals at a home visit after the birth. This is not a new phenomenon: upwards of 90% of dads have been attending births for three decades. And yet, 30% of fathers in our survey were rarely or never talked to directly by medical staff during routine antenatal appointments; 55% weren’t addressed by name; still more (65%) weren’t invited to talk about their impending role as father. Engagement with dads was even less likely during ultrasound scans. Some dads felt shut out during and after their baby had arrived: almost three quarters (74%) said the hospital had no facilities for them to stay overnight, and nearly half (44%) felt the hospital visiting policy led to them spending less time with the mum and baby than they would have liked. Why does any of this matter? Well…apart from wanting to be there for themselves, fathers say their presence can be helpful: almost half (48%) believe the birth was safer because they were present, and 96% feel that staying after the birth can be helpful to mothers. Four-fifths (81%) of dads believe they can help staff too. And Who’s the bloke in the room? – our comprehensive review of research into fathers during pregnancy and birth, published this week – provides plenty of evidence that fathers have a huge impact on the very outcomes one would imagine maternity professionals most care about, like safe births and healthy mums and babies. It’s surprising to find, then, that fewer than a quarter of dads surveyed had been asked about their physical health (22%) or diet and exercise (18%), despite evidence that these impact on the mother’s and baby’s health. Even though a father’s mental health is closely correlated with a mother’s, only 18% of dads surveyed had been questioned about it. Around half (48%) had not even been asked about smoking, despite the risks of passive smoking to babies, and fathers’ key role in supporting pregnant mums to give up. So what’s the problem? Why does the NHS still not know how to deal with dads? Our report suggests two main reasons: an exaggerated belief in the number of ‘single mums’, and a similarly exaggerated belief in the risk of domestic violence. These two, combined with a lack of basic procedures that could turn expectant and new fathers into engaged and valued participants in a family-centred approach to maternity, result in what many fathers experience as a hostile and even inhumane environment. The fathers we surveyed acknowledged the importance of the work doctors, midwives and other professionals do in the UK’s maternity services; many heaped praise on them and almost all stressed that mums and babies should absolutely be the priority. 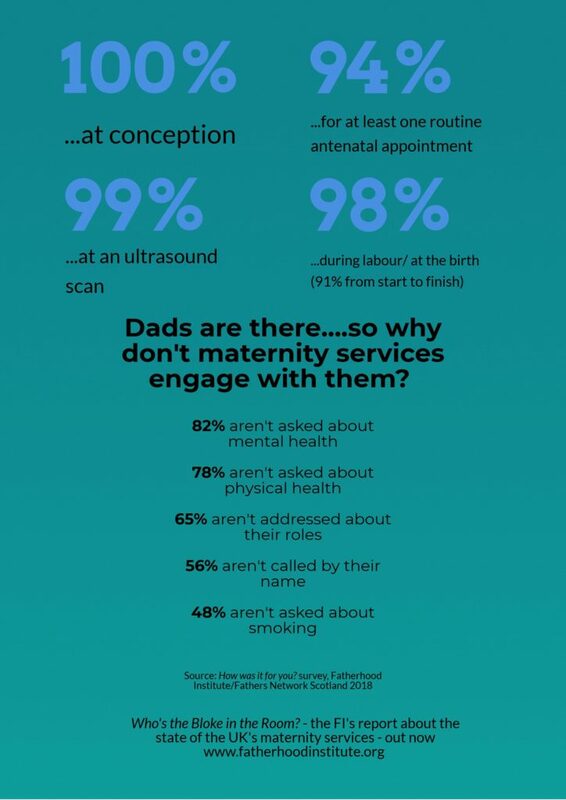 But herein lies the problem: involving dads should surely be intrinsic to providing the best possible service for mums and babies – as the NHS’ own guidelines already state by calling for services to be “woman-focused and family-centred”. This is not a question of maternity services distracting themselves from their main purpose, so as to accommodate the needs of men for the sake of it. Rather it is one of services doing better their core job of supporting women to have safer births and healthier children, by valuing and harnessing the crucial roles that men can and want to play. Mothers and babies aren’t created in a vacuum. Let’s start recognising that. Happy Father’s Day.